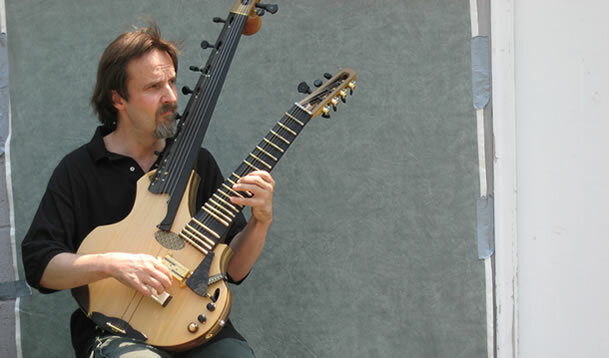 Originally from Finland, Ari Lehtela has been involved in music in North America for over three decades. Playing music professionally in Canada and the U.S. throughout the 1970s and 80s Ari eventually turned his attention to building guitars. Around 1990, Ari began to toy with the idea of designing and building his own guitar. This idea was solidified after meeting a local Charlotte (NC) builder, Luke Lukuer. Impressed by the sound and playability of Luke's instruments, Ari realized that handmade was the only way to go. Another interest that continues to hold Ari's attention is fine art and design — Ari holds a degree in fine art. Lehtela guitars are truly custom instruments that are designed for the individual player. The tone and playability, design and construction, are unsurpassed. Harmony and balance between function and esthetic is one of my primary objectives as a guitar builder. For me, these are the essential elements of good design. A well-designed instrument will exhibit uniformity of sound in all registers of the neck. Essentially, the ' sweet-spot ' is experienced throughout the neck. This is achieved by having rigidity and resonance in their appropriate places — rigidity in the neck and the carved or bent sides of the body, resonance localized within the soundboard. Similar qualities are achieved in solidbody instruments as well. Body resonance is optimized by usage of aged, light or medium weight tonewoods dimensioned to the the right thickness.